Almost everyone wants to experience their Day in the Spotlight, their 15 minutes of fame. Now is your chance to give them that notoriety, motivate your students, and celebrate their success all at the same time!A few years ago, I began highlighting one of my Career Pathways Bridge MA students every month as the Spotlight Student. The student voluntarily completed a short questionnaire about their background, why they chose the MA program, what was their favorite and least favorite course, and any advice that they would give to new CPB students. The answers to the questionnaire and a picture of the student was then posted on Blackboard and distributed to the students in the program. Any student who was not comfortable being in the Spotlight had the ability to decline. The results were amazing. The Spotlight Student often showed up for class with more confidence and a renewed energy for their coursework and the program. 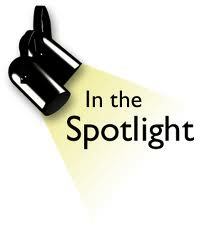 Students who had not been Spotlighted yet, wanted to know what they needed to do to be the Spotlight Student. I began to see an increase in motivation and a desire to succeed in times when students were struggling to overcome challenges and be successful in an environment that was foreign to them. For the CPB MA program, Spotlight Students weren’t necessarily the best in the program, but instead were students who had done something great. They had met program benchmarks, passed their GED, obtained U.S. Citizenship, had a baby without missing a day of class, or even just passed a test or performance assessment in a class where they had been struggling. It was and continues to be all about celebrating success and motivating others. What a fun, creative concept, Karla! This is something the K-6 system has done for many years with positive results in terms of motivation and self-confidence, and I think the way you manage the idea lends itself to both On Course and student engagement well! Though more difficult to do within a General Studies course, it definitely sounds like a practical tool for those programs seeking to create more unity and cohesion with their students. Thanks for sharing! Though more difficult to do within a General Studies course, it definitely sounds like a practical tool for those programs seeking to create more unity and cohesion with their students. Thanks for sharing!